What happens when you attempt to translate the whole of James Joyce's Finnegans Wake into images? Two Polish artists are close to finding out. For Krzysztof Bartnicki, this is already his third translation of the Wake – this visual translation follows his attempts at linguistic and musical renderings. After having translated Finnegans Wake into Polish (a project that took ten years to complete – more here), and turning Joyce’s text into a one-of-a-kind musical score in Da Capo al Finne (read more) which in turn yielded encrypted music from both past and future (including themes from the Star Wars soundtrack – listen), Krzysztof Bartnicki has now moved to another field of practical Wakeology. His newest endeavour is an attempt to illustrate the whole of Finnegans Wake, page by page. But 'illustrating' actually might not be the right word when it comes to the world’s most difficult book. Bartnicki prefers to speak of it in terms of translating the text into a visual language. In this, he is not alone. The task of translating Joyce’s text into image lies with Marcin Szmandra, a graphic artist and, just like Bartnicki, a keen reader of Joyce’s magnum opus. For the last three years, after the publication of Bartnicki’s translation of Finnegans Wake in 2012, Szmandra has been laboriously going through Finneganów tren (this is the title of Bartnicki’s Polish version of the Wake) illustrating the Polish text page by page, and gradually publishing his work on his blog Finneganowizje. While this is a work in progress in its own right, Szmandra and Bartnicki have now decided to join forces and started collaborating on a project that shall materialize as a full visual illustration/translation of the original text of the Wake. The project is tentatively titled Finnegans Meet and it looks like what it aims to be – quite a unique and intriguing meeting of literature and visual arts. Since 2012, when Joyce and all of his works entered the public domain, Finnegans Wake has drawn much interest from artists and readers. Many of their Wake-inspired productions, which range from visual to audio and multimedia works and renderings, can be found on the internet, a seemingly perfect place for all Wake-related works (find out more about Finnegans Wake and the internet here). And while illustrating Finnegans Wake may seem like a tough nut to crack, visually speaking, it is by no means a rare undertaking in the world of Wake fans. What is then so exceptional about Bartnicki & Szmandra’s endeavour? When I first approached the idea of translating Joyce’s text into image, I immediately thought of Marcin [Szmandra]. Not only does he try hard to stick to the subject of Joyce’s text, but he has been progressing through the book page after page, says Bartnicki about Szmandra’s Finneganowizje. I didn’t want our [visual] translation to drift away into abstraction which would make the reader’s trust the only way of vouchsafing that the illustration refers to Finnegans Wake and not to any other piece of prose. I also didn’t want to propose a set of illustrations (sets are static) or a Finnegans Wake comic strip, as I felt that a comic could paradoxically turn out not sufficiently abstract and ambiguous. As a result, the two decided on an altogether different approach to visually representing the Wake. Instead of trying to illustrate fragments of the Wake, Bartnicki came up with an idea that each page from Joyce’s text should have its own calling card. With this in mind, he has been interpreting each page of Finnegans Wake in an attempt to bring it down to a person, name or theme, which could then serve as a kind of hero or subject of a business card. This also allowed them to add a textual layer to the image – but, as Bartnicki explicates, not too much, as the text should complement the image rather than dominate it. 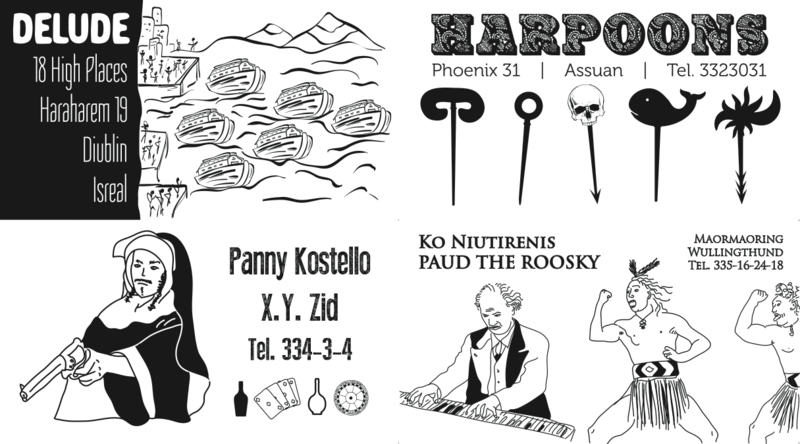 Indeed, every illustration in Bartnicki and Szmandra’s Finnegans Meet follows the pattern and format of a business card with a quasi-name, address, and a ‘telephone number’ (which however hides the exact ‘address’ of the words used in Joyce’s book, e.g. phone number 370-06-07 refers to page 370, lines 6-7 in the text of the Wake). The ‘address information’ along with the quotes and the general idea for the business card come from Bartnicki, the visual realization of these instructions and their translation into visual language – are Szmandra’s tasks. The final visual effect is the result of a discussion between the translator and the illustrator. 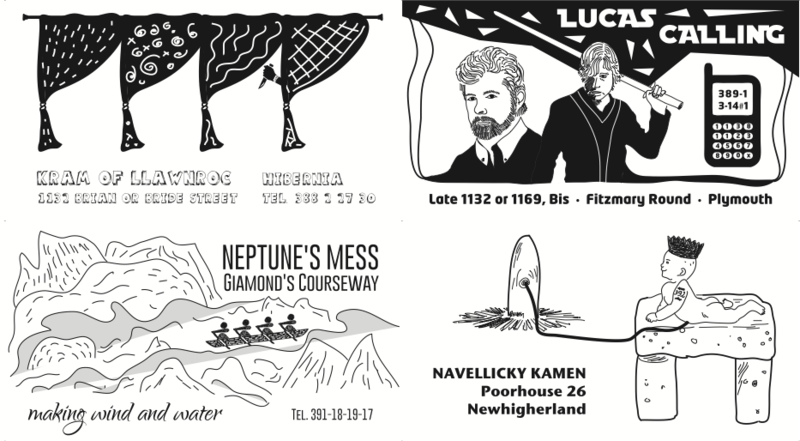 For the reader/viewer each business card may seem like a visual puzzle, as the cards attempt to render Joyce's linguistic puns into images, or rather a combination of image and text. This invitation to interpretation naturally entails consulting the book which may turn out helpful in understanding the ‘contents’ of the card. While most of the cards feature textual material taken directly from The Wake, a careful 'reader' of these miniatures will also come across a few quite surprising finds. Like card 375 which includes Joyce's words 'Let them leave Poland in peace' taken from outside Finnegans Wake: these were apparently the words with which Joyce reacted to the outbreak of WW2, and a way of suggesting to the world what was more important in 1939: the German war on Poland or the newly published Finnegans Wake. Visual surprises may include finding the strangest post-Joycean themes and motifs, like characters from Star Wars or The Simpsons in some of the cards. This goes back to Bartnicki's strong conviction that Finnegans Wake lends itself not only to new readings (and these are not necessarily literary! - compare the compositions of contemporary composers in Finnegans Wake, decoded by Bartnicki as Da Capo al Finne) but also that these readings can refer to contemporary ideas and realities unknown to Joyce. For Bartnicki however the most important thing in illustrating Finnegans Wake was finding a way to reflect what he calls the ‘rotary flow’ of Joyce’s narration. This means that the end of the last page smoothly becomes the beginning of the first page – and thus proceeds in an ultimately circular movement. This found its way into how the finished work will be presented. So far each of the business cards exists only in two paper copies, belonging to the authors. 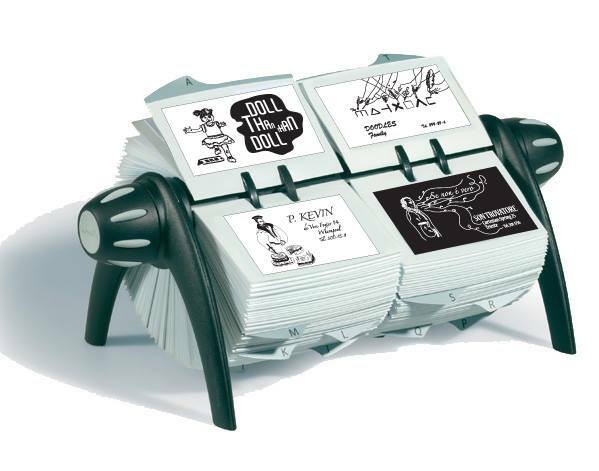 Each card is then placed in a two-column Rolodex, which serves as an ersatz for the rotary narration of the novel, but also guarantees, as Bartnicki explains, some dose of randomness in the order of the cards. Because the two columns of the Rolodex are separate, their movement will inevitably interfere with the initial order of the pages, that is, of the business cards, shuffling them and effectively changing the initial order of the book. So far Bartnicki and Szmandra have been working on two showpiece copies of the Rolodex, which can be seen as the prototypical artefacts in this process of turning the Wake into… well, a business card holder. As Bartnicki explains, producing the Rolodex-ed Wake is an expensive and technically painstaking process (technical obstacles include the fact that the Rolodex used has only 600 visit cards, while Finnegans Wake has 628 pages). Someone who, instead of the whole Finnegans Wake Rolodex, is interested in a selection of 10 cards, would be an equivalent to a reader who rather than reading the whole of Finnegans Wake goes for a short fragment. Work on Finnegans Meet is quite advanced, with almost 400 cards already finished, and the chances are that the whole project will be complete by the end of 2015. As to the philosophical implications of the Rolodexing of the Wake, much is uncertain. Is it an aide-memoire, or a way of mapping otherwise unchartable text? Will the Finnegans Meet project find a way to exist on the internet? – all of this remains to be seen. For the Polish translator of Finnegans Wake it is yet another and definitely not last attempt at tackling Joyce’s last novel, and dealing with its greatness.